Good grief. Here it is, the 21st day of June, and I've not put in a blog entry all month. I really intended to get better rather than worse, and will offer no excuses here other than to say I've been busy doing other things on the weekends especially. Hanging out with the boys, a work trip to California, and now Father's Day. I'll get the blog post done this morning before anyone else wakes up. Deal? The book, if you hadn't been able to guess by now, is really well done in my opinion. It is targeted at children and young adults, although I suspect that most children would still struggle with a lot of the concepts. 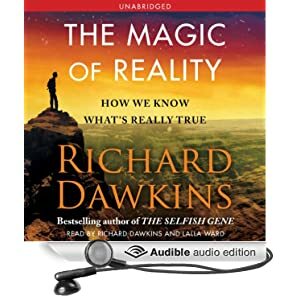 It begins with a good explanation of the scientific method (in order to explain how we know things at all) followed immediately with an effective illustration of evolution (Dawkins's real passion). Most of the chapters talk about an interesting/hard question (like "Why are there so many different kinds of animals? ", "What is the sun? ", "What is a rainbow? ", "Are we alone? ", and "Why do bad things happen?" to name a few). The chapters begin with lots of different mythological answers to the questions, then follow with the scientific explanation. Some of the scientific concepts are difficult to understand regardless of the language used, which is why I'm skeptical that children would fully appreciate this book. That said, I think all of the content is consumable by young adults and I strongly encourage that consumption. The other thing I like about this book is that Dawkins pulls in lots of different mythos from lots of different cultures. This is not a book that pokes fun at mythology (well, he can't resist a couple of pretty minor jabs). Since I enjoy studying both mythology and science, the books is compelling to me along two fronts. Content review: 4.5 out of 5 stars. Dawkin's audio recordings are often read by himself and Lalla Ward. The first time I listened to one of these recordings, I was pretty put off. Both are excellent narrators -- why not just have one or the other read the whole darn thing? It doesn't bother me as much in this book, although there are still a couple of spots where one or the other jumps in for only a sentence or two. Those parts are pretty jarring. Otherwise, the audio recording is very well done. Again, no illustrations can be had this way, which was one of the original selling points. Narration/recording review: 4 out of 5 stars. Hopefully there aren't too many spoilers in this for anyone. I feel like you should know what you're getting into. This is not a heavy science book, but it's also not great for children. It's sweet spot is young adults or people that haven't had much of an introduction to the natural sciences or mythology. It leaves you with lots of interesting threads to pull on if you want to dig deeper into either side. I highly recommend this book. Go read it!